Unique 'Orbital' Scaling Action Removes Tough Calculus Low Frequency 6400 Hz Reduces Pain and Bleeding. Benefits: Substantially less patient pain and bleeding. Fully autoclavable. Gentle enough to remove calculus subgingivally and on children's teeth. 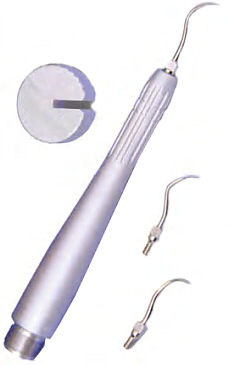 Rand's Slim-Tip removes calculus in interdental areas and molar furcations. Improved tactile sensitivity to calculus adherence promotes thorough scaling even under indirect visualization. More delicate manipulability enables operator to avoid hypersensitive tooth areas. Minimal water spray keeps work site visible. Connects directly to airhose of high-speed handpiece.